What’s it all about ? It’s about Delavan! 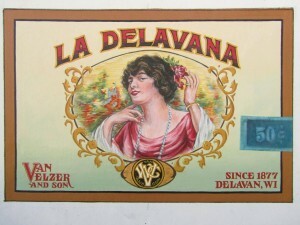 Delavan’s unique contribution to the rich history of Wisconsin. 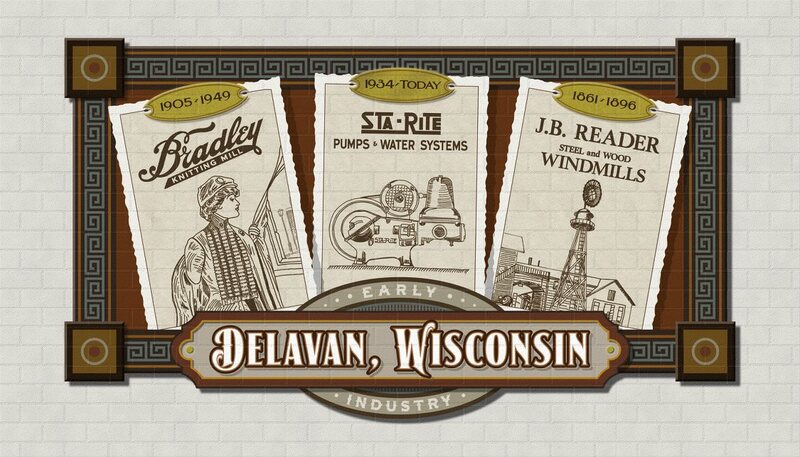 This Event celebrates the colorful history of Delavan’s Founders, the people, events, industry, small businesses & every part of the puzzle that shaped the Delavan we see today. The Delavan Walldog committee will be digging through the past to find unique history that tells the great story of Delavan. 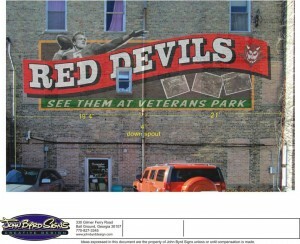 Starting June 24 – 28, 2015 the Walldogs will arrive to put that past into beautiful, colorful Murals on the walls of Delavan. 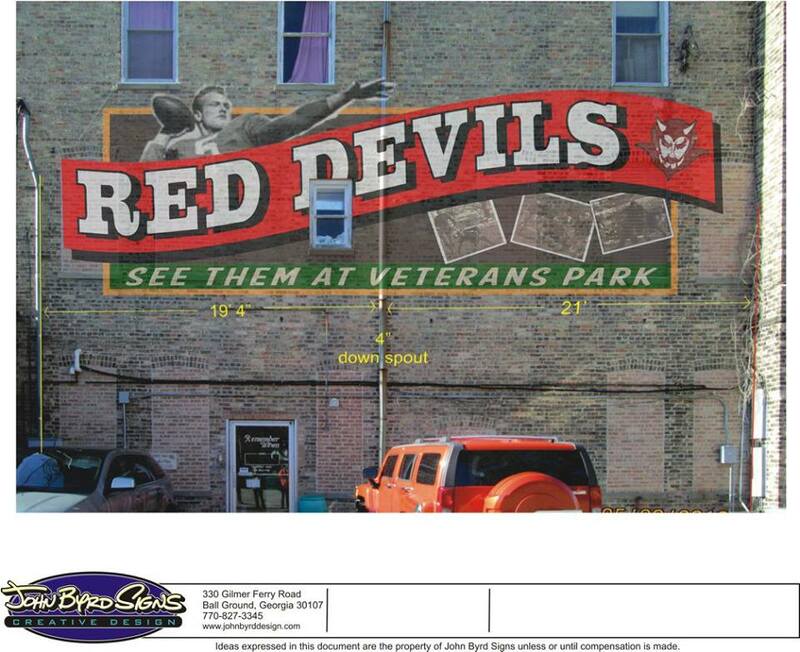 These Murals will represent the newest piece of Delavan history and will be preserved for years, long after the Walldogs have finished. Delavan’s Murals will help future generations appreciate the contribution that Delavan has made in Wisconsin and world history. 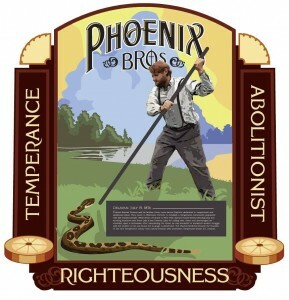 If you love your town, these Murals will give you a further sense of “Hometown Pride”. These colorful masterpieces will also welcome visitors and invite them to explore our great town. Now that you know what it’s all about we invite you to be part of this historic phase of Delavan history. Come along side us and volunteer, we would love to meet you. 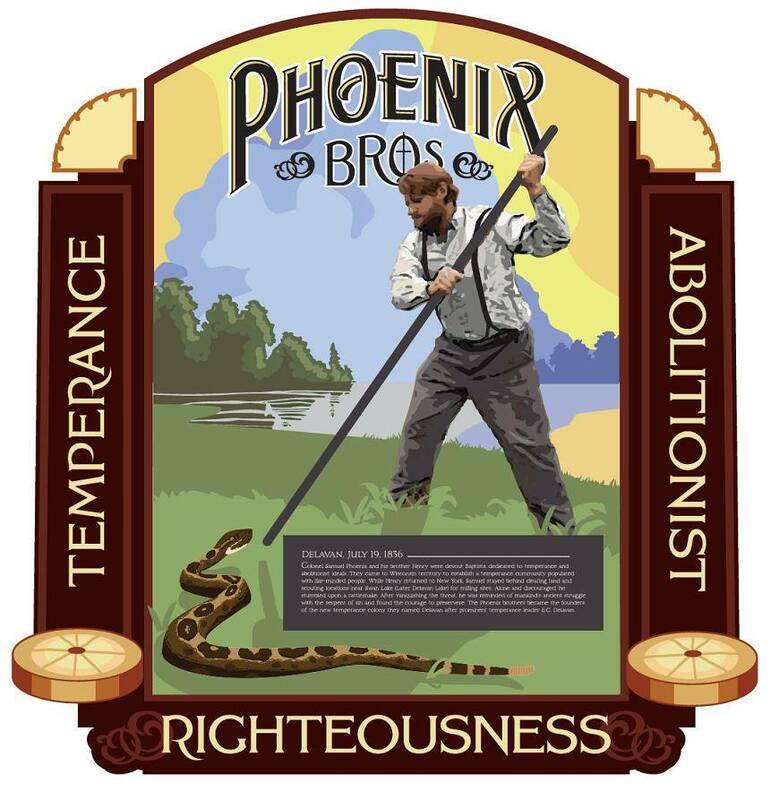 Founders & Temperance Beginnings by Project Leaders Bob Saul & Doug Hancock. 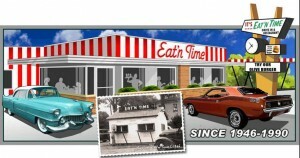 Elmer Gauger, Sign Painted by Project Leaders Brad and Kit Bandow. Tribute to the Military by Project Leaders David & Susie Butler and Dennis & Pat Raap. Birthplace of the P.T. Barnum Circus by Project Leaders Bill Diaz and Eric Elmgren. Wisconsin School for the Deaf by Project Leaders Nancy Bennett and Jay Allen. 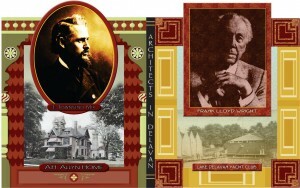 Architects in Delavan: Frank Lloyd Wright & E. Townsend Mix by Project Leaders Gary Anderson and Chris Shuster. Circus Stamp/Gordon Yadon by Project Leaders Mike Harper and Bernie Poff. Red Devils Football by Project Leaders John Byrd and Chris Lovelady. Van Velzer Cigar Company by Project Leaders Carol Bersin and Alicia Rheal. Early Industry by Project Leaders Manfred Didier and Marcus Goebels. Rodriguez Brothers Potato Farm by Project Leaders FranCisco Vargas and Alicia Jennings. 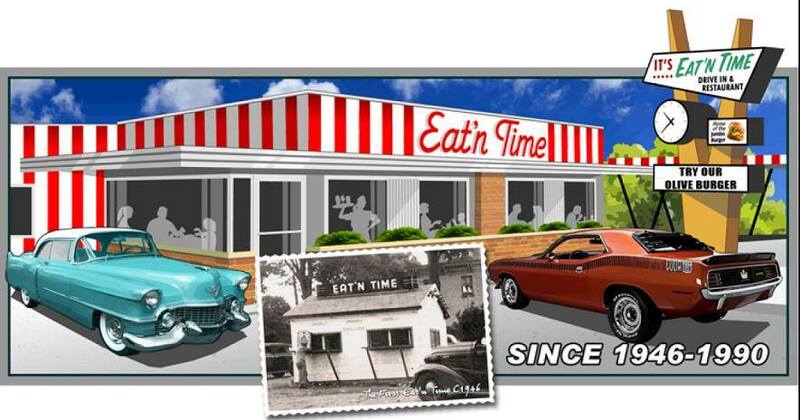 Eat’n Time by Project Leaders Tom & Kathy Durham and Brent Logan. Muster Tree/Train Depot by Project Leaders Ben & Joe Diaz. Borg-Gibbs-Bradley WWII Products/War Years by Project Leaders Sonny Franks, Eric Skinner, and Russell Kelley. Kids Wall by Project Leader Rachel Pfarr. Big Bands & Ballrooms by Project Leaders Carol Kauffmann and Joy Kjer. 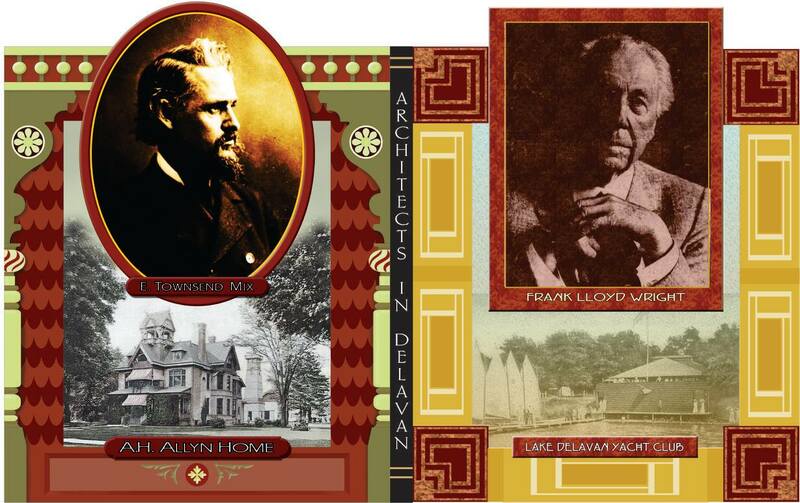 Delavan Lake Steam Ships/Resorts by Project Leaders Robert Estes and Alan “Doc” Wetley.